An original section of Route 66 is preserved in Flagstaff Route 66 Park. Flagstaff is a Route 66 town not like many other Route 66 towns. While Route 66 bypassed a lot of towns, causing those towns to disappear, Flagstaff wasn’t affected in the same way. 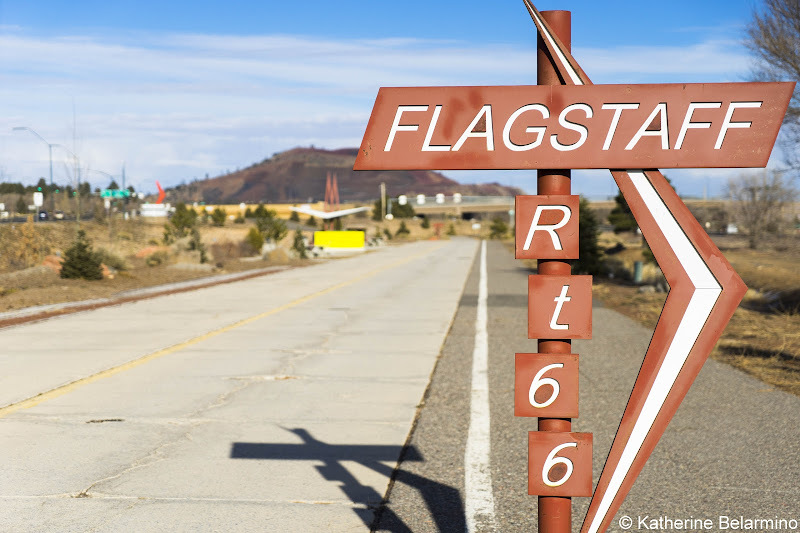 Flagstaff was established in 1882 and has a lot of history that predates Route 66, so Flagstaff didn’t completely rely on Route 66 to survive. Today it is a bustling college town with a historic downtown and some remaining remnants of Route 66. 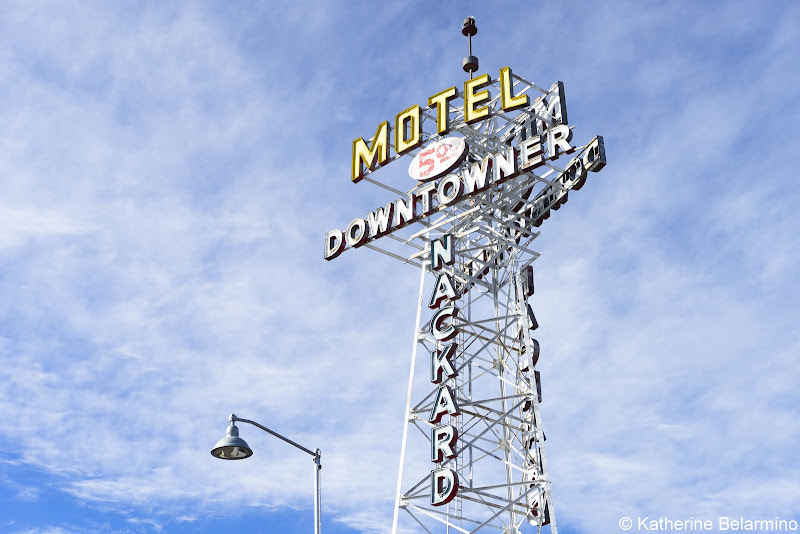 While there are a lot of things to do in Flagstaff, many of Flagstaff’s historical and Route 66 sites are close together and can be visited in one day. Downtown Flagstaff courthouse and . . . a pay phone? 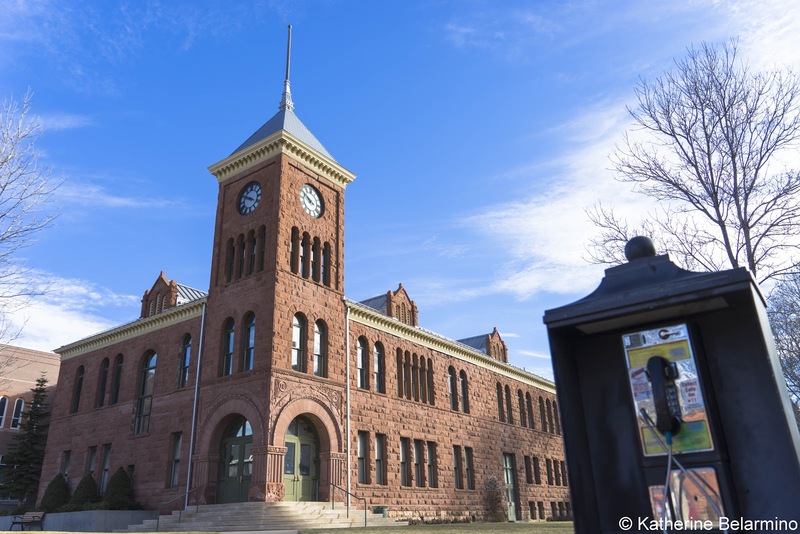 Flagstaff has a historic downtown that feels more like it belongs on the east coast rather than in the west with its tall brick and stone buildings. 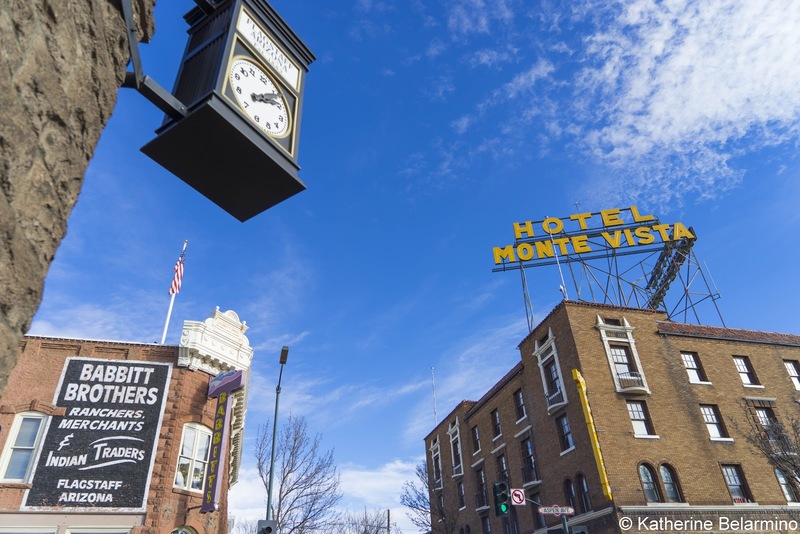 We recommend starting the day early in the morning with a self-guided walking tour of Flagstaff’s historic downtown. The light is beautiful in the morning, shining in between the buildings, and the streets are empty. It feels like you have downtown all to yourself. The Flagstaff Visitor Center city map highlights a number of historic buildings to be on the lookout for in Flagstaff’s historic downtown. The Weatherford Hotel first opened its doors on January 1, 1900. The hotel was built by John W. Weatherford, who arrived in Flagstaff in 1897. The hotel has been visited by pioneers and presidents. The Weatherford was listed on the National Register of Historic Places in 1978. It’s fitting that a hotel that opened its doors on January 1 now hosts Flagstaff’s annual New Year’s Eve celebration with a pine cone drop. Just down the street from the Weatherford Hotel is the Orpheum Theater, which used to be the Weatherford Opera House. In 1915, a snow storm dropped five feet of snow on Flagstaff, which flattened a number of downtown buildings, including the opera house. Weatherford rebuilt the theater and named it the Orpheum. Be sure to walk into the alley next to theater to see the colorful mural painted on the side. On the corner of Beaver Street and Cherry Avenue stands the Church of the Nativity of the Blessed Virgin Mary. The church is built with local volcanic rock. 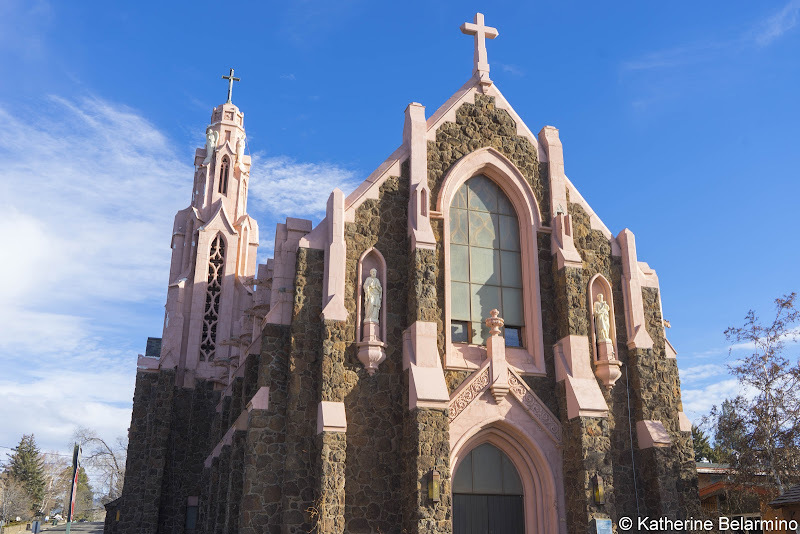 It was a little surprising to see that the church is rather pink in color. 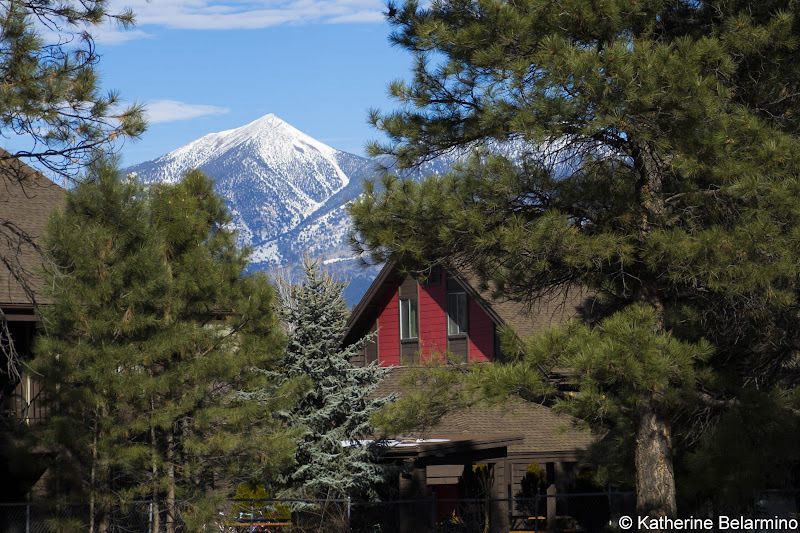 Walking along this part of downtown also features views of snowcapped mountains providing the backdrop to historic Flagstaff. Central to historic downtown Flagstaff is Heritage Square. 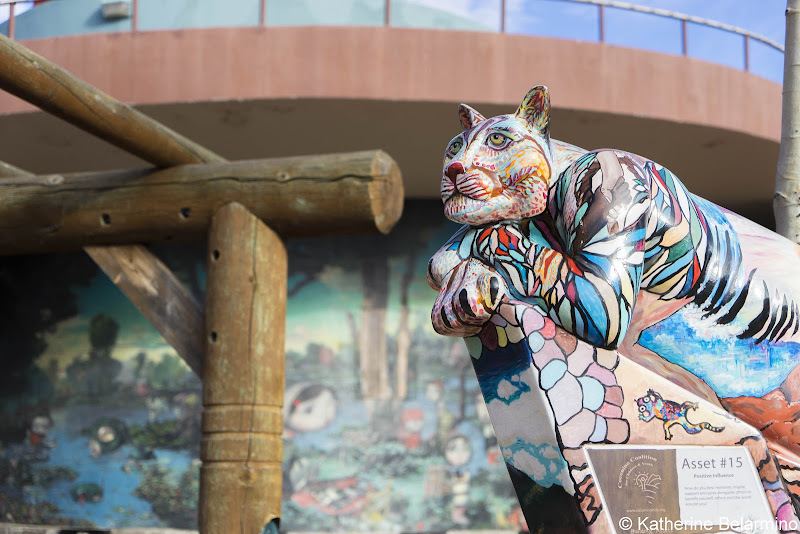 Heritage Square is an open-air amphitheater and a new part of Flagstaff’s history. This gathering place was created as part of the revitalization of downtown Flagstaff. On the corner of San Francisco Street and Aspen Avenue are two historic buildings, the Hotel Monte Vista and the Babbitt Brothers Building. 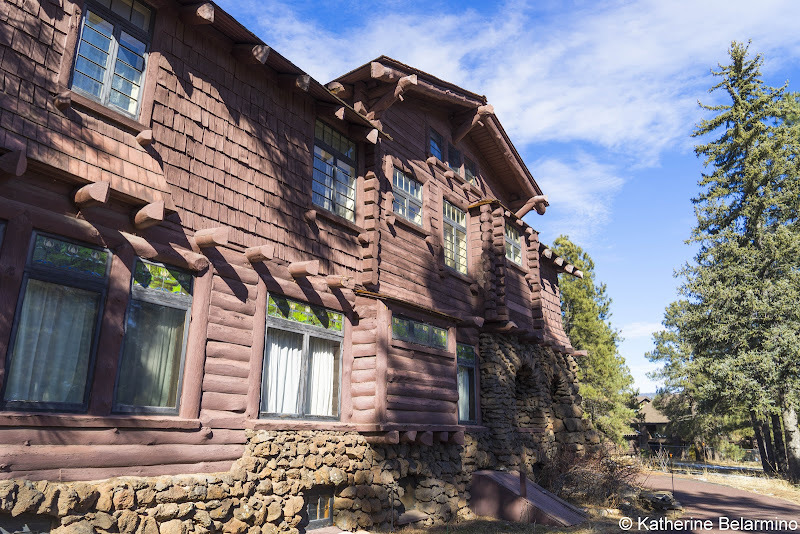 The Hotel Monte Vista was built in 1926 using funds donated by the novelist Zane Grey. 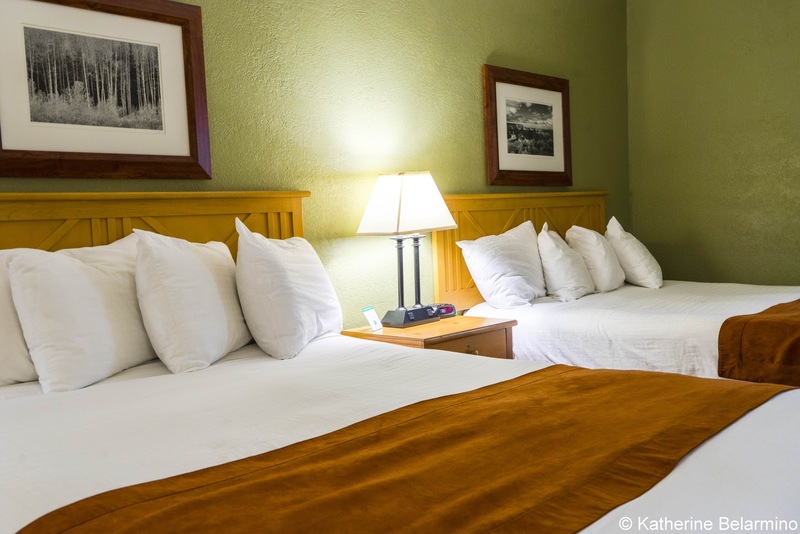 The hotel filled a need for new, first-class accommodations and is another of Flagstaff’s historic and still operating hotels. It is also on the National Registrar of Historic Places. Across the street is the Babbitt Brothers Building, which started as a building-supply store in 1888 and eventually became Arizona’s largest department store. The building is in the process of being restored. 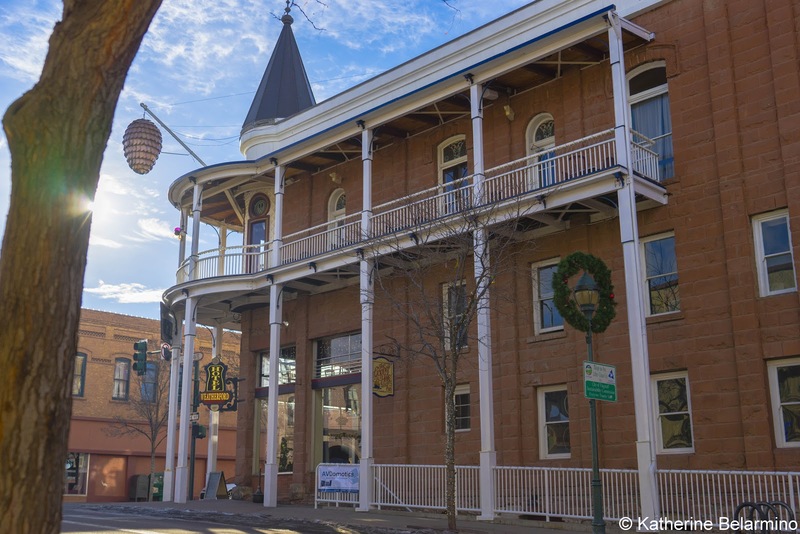 In addition to historic buildings, historic downtown Flagstaff has shopping and dining. 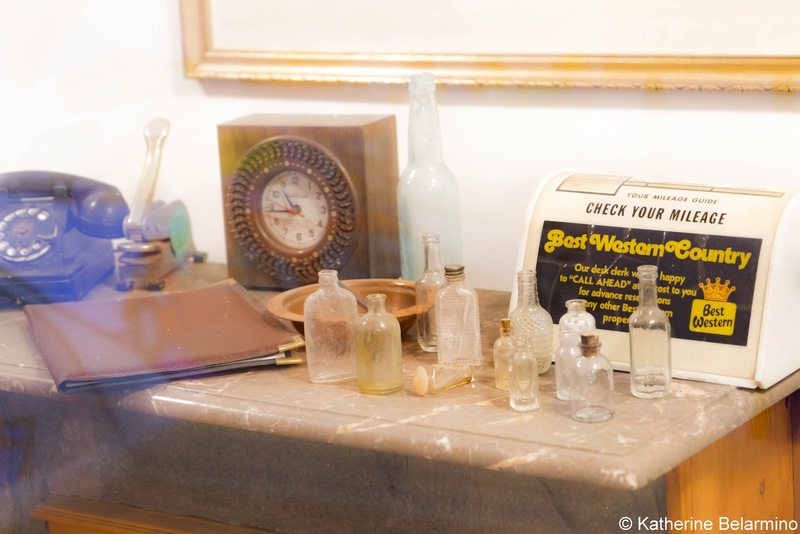 The shops of historic downtown Flagstaff are unique, providing one-of-a-kind shopping opportunities in art galleries, antique stores, and gift shops. Be sure to visit my new friend George Averbeck, who is one of the owners and artists of the Arizona HandMade Gallery. 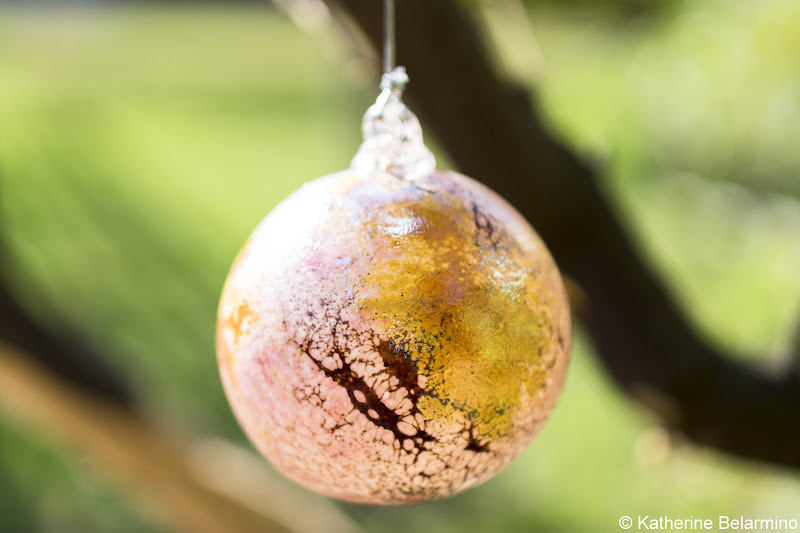 He makes hand-blown glass art under the name Fire on the Mountain. He is an illustration of how friendly the people of Flagstaff are. We struck up a conversation on the street when he rounded the corner and was surprised by me crouching on the sidewalk taking a picture. That chance meeting turned into me learning more about Flagstaff from the view of a local and bringing home a beautiful glass Pluto ornament, a perfect Flagstaff souvenir as the dwarf planet Pluto was discovered in Flagstaff at the Lowell Observatory. 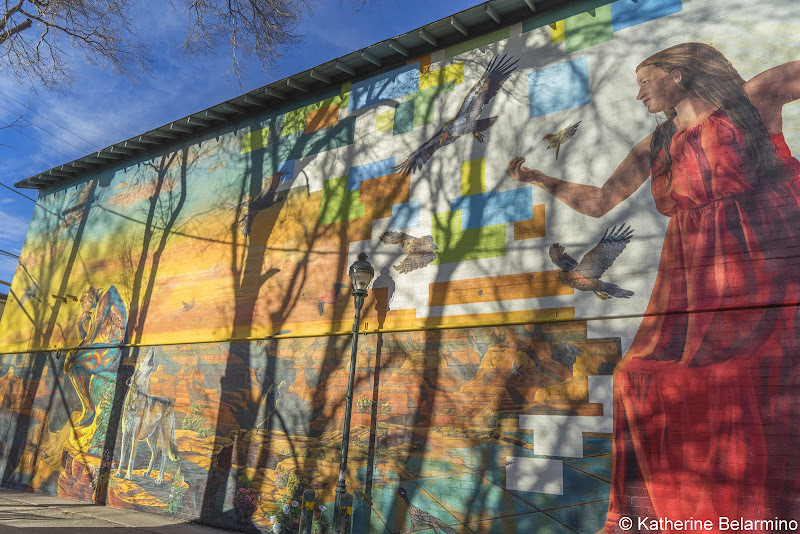 While exploring historic downtown Flagstaff on foot, turn down some of the alleys and enjoy the murals and street art that can be found. 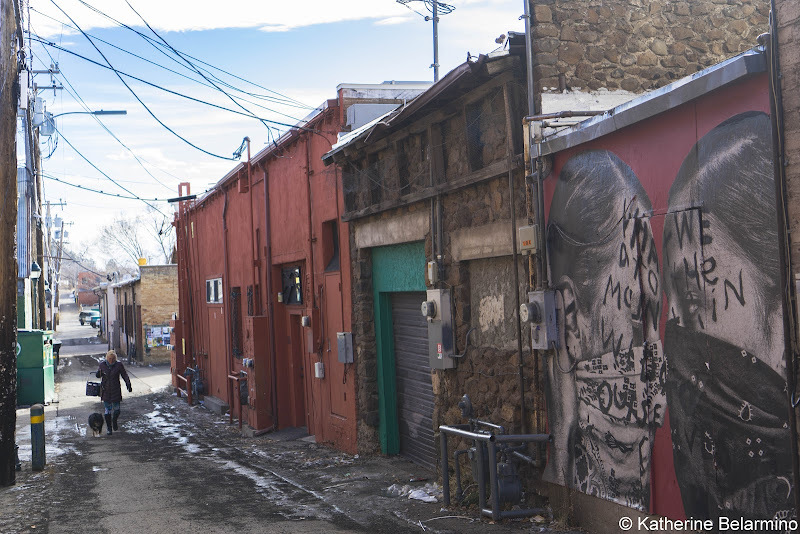 In case a walking tour of historic downtown Flagstaff isn’t enough, across Route 66 from historic downtown is another section of historic Flagstaff for your walking pleasure. 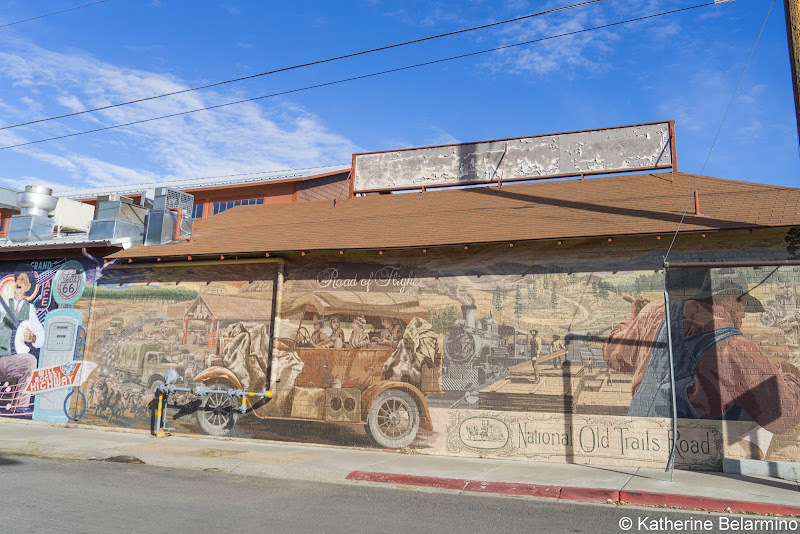 While the downtown tour weaves through tall stone and brick buildings from the late 1800s, this side of the street feels more like what you would expect from a Route 66 town with old hotels, neon signs, and, of course, a train station. Flagstaff grew up around its train station. Santa Fe Plaza and the 1897 depot are a good place to start a walking tour of this side of Flagstaff. In front of the depot is a sculpture commemorating the Candy Dancers, railroad laborers who started building the railroads. Candy Dancers got their name because they were able to move heavy sections of railroad by working in unison by using a song to keep a beat. Further down the tracks on Phoenix Avenue are two hotels that hosted Route 66 road trippers. The Downtowner Motel was first opened in 1919 and continued to provide lodging through the Route 66 era. The neon sign still advertises $5 rooms. The hotel is now a hostel and private apartments. On the next block is the old Motel DuBeau Travelers Inn, which was built in 1929 and is also run as a hostel today. Across the street from these old hotels is a long, colorful mural depicting scenes from Route 66. The historic walking tour continues along Mike’s Pike, the original Route 66, and Milton, passing Route 66 relics like B&M Auto Camp and Granny’s Closet. 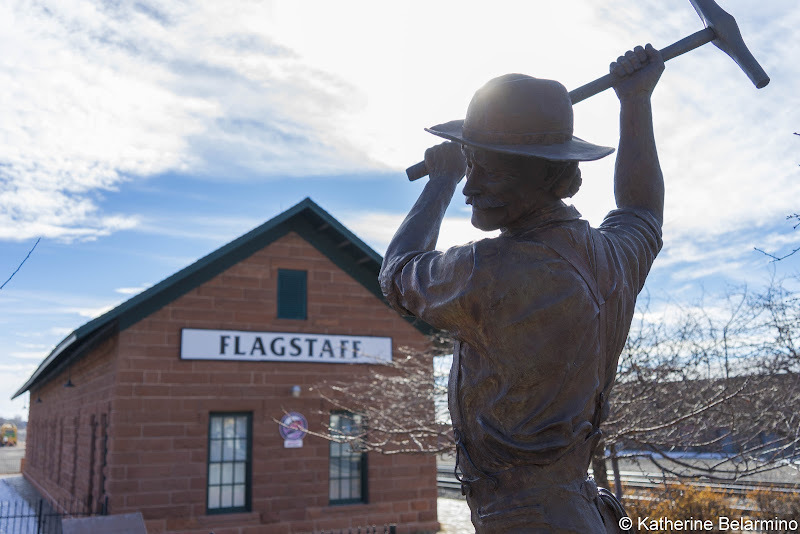 The Flagstaff Visitor Center has created a guide to this historic walking tour, which includes lots of history. 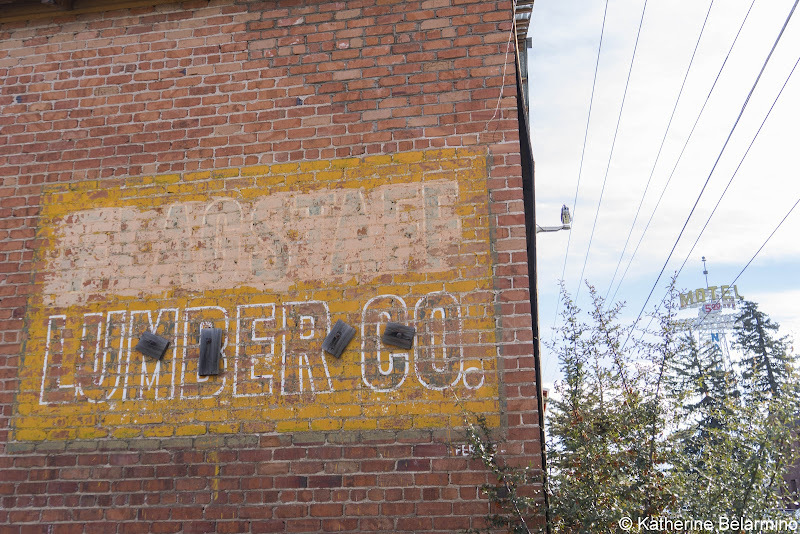 An important part of Flagstaff’s history involves the Riordan family. Travelers can learn more about this history by visiting and taking a guided tour of the Riordan Mansion, the home of brothers Timothy and Michael Riordan. Timothy and Michael Riordan moved out to Flagstaff to run the family logging industry. They met and married sisters Caroline and Elizabeth Metz, who were cousins to another famous Flagstaff family, the Babbitt brothers. The two couples decided to build a large duplex home in 1904. They lived in identical homes which were connected in the middle with a common living room. While they lived in the same building, they were able to have complete privacy. Even their front doors faced opposite directions. The home was built in the Arts and Crafts style with lots of built-ins, like a built-in refrigerator, and designed to blend into nature. There are beautiful decorative features like stained-glass windows, sepia photos transferred onto the windows of the common room, and a chandelier made of logs. During the tour we learned the family did great things for Flagstaff, like selling land to Percival Lowell for $1 for Lowell Observatory to bring science into the area. They also helped establish Northern Arizona University, built on land that used to be their tennis court, and the Fort Valley Experimental Forest Station. Muffler Men were huge fiberglass sculptures that were used as roadside advertisements. There were men holding mufflers, men holding axes, and even men holding hot dogs. Muffler Men became icons of Route 66. The very first one created was a Paul Bunyan lumberjack holding an axe. This first Muffler Man was outside of the Paul Bunyan Café, now Granny’s Closet. 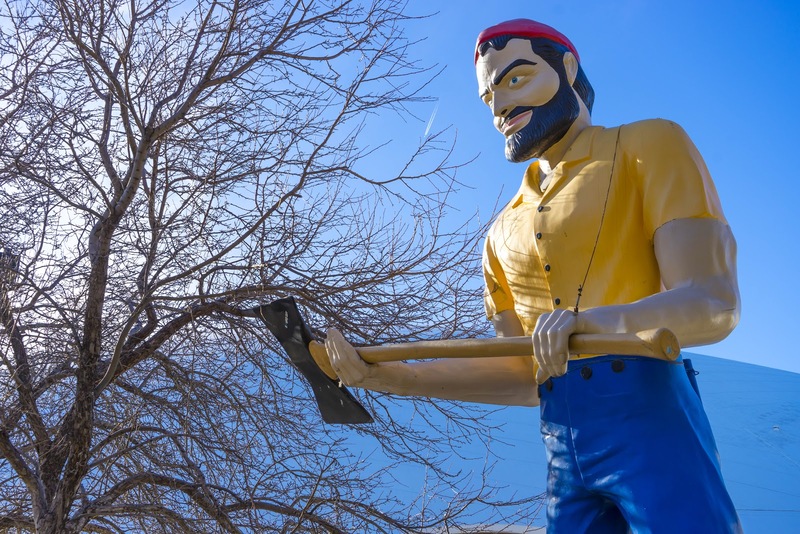 The lumberjack has since been moved and can now be found in front of the Skydome at Northern Arizona University and is the mascot for the NAU Lumberjacks. 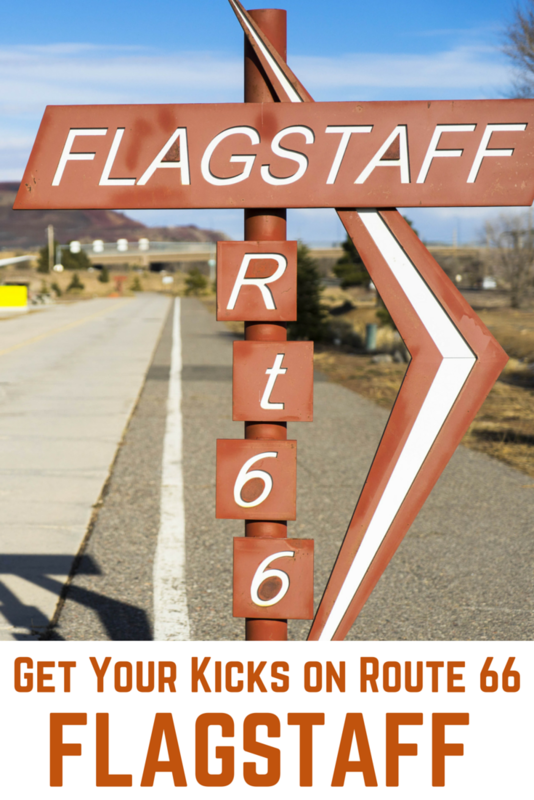 When Route 66 came through Flagstaff, it shaped the city. The two-lane road went straight through town and became lined with motels, auto repair shops, gas stations, and diners. Traffic became so bad on Route 66, the road had to be widened to four lanes. An original stretch of Route 66 is preserved in Flagstaff Route 66 Park. The park is located between East Industrial Drive, North Fanning Drive, and Route 66. It’s a little difficult to get to as there is no parking dedicated to the park, but it’s pretty cool to stand on this original piece of history. 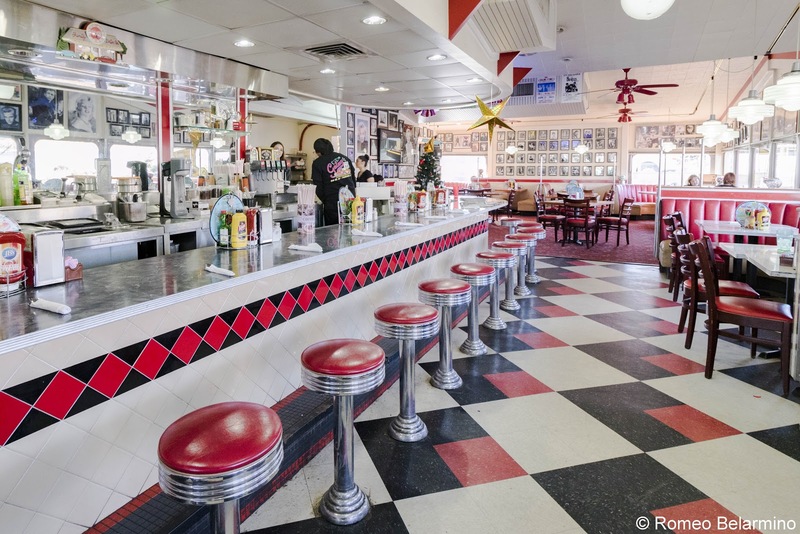 While not an original Route 66 diner, Galaxy Diner is located on Route 66 and brings back the 1950s with its menu and décor. Galaxy Diner is the home of 100 shakes and malts, which threatened to explode my brain, so I went for an oldie but goody, the chocolate malt, along with a patty melt. When’s the last time you had a malt? While in Flagstaff, we stayed at the Best Western Pony Soldier Inn & Suites along Route 66. Best Western Motels was founded in 1946, the same year Highway 66 got its nickname Route 66. By 1963, Best Western was the largest motel chain with 699 properties, including some along Route 66. Best Western offered “Call Ahead” service for road trippers. Guests could check the Best Western mileage guide for route suggestions to their next destination, and the desk clerk could call ahead and make advance reservations at any other Best Western property on the guest’s route. Today, the Best Western Pony Soldier Inn & Suites is a great place to stay on a Route 66 road trip. Rooms are big with tile floors, which is great for guests taking advantage of the hotel’s pet-friendly policy. A complimentary buffet breakfast is served every morning in the large detached breakfast room. The lobby has a southwestern flair with woven baskets and tomahawks on the wall. 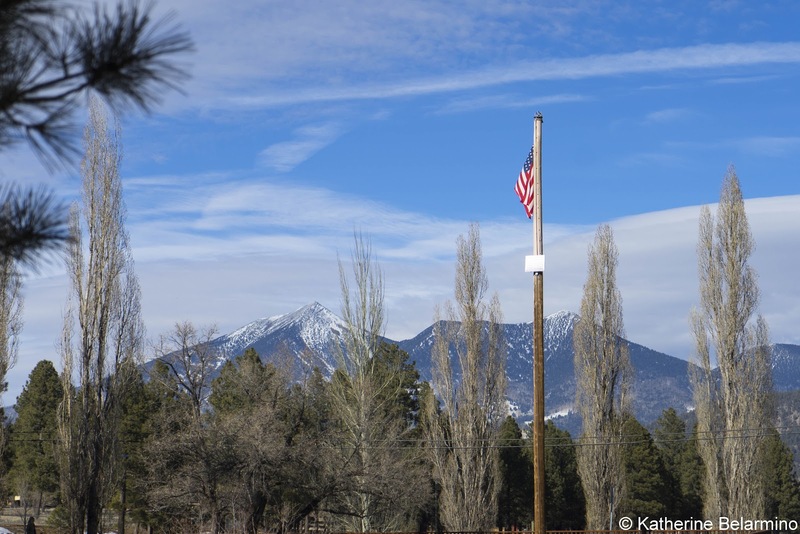 Flagstaff got its name from a flagpole made from a stripped pine tree erected July 4, 1876, to celebrate the nation’s centennial. 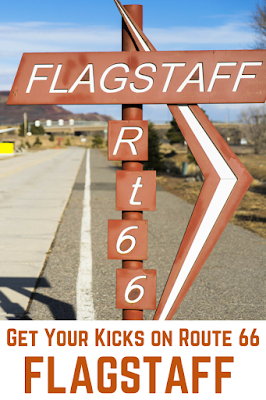 Thank you to the Flagstaff CVB for hosting the Flagstaff portion of our Route 66 road trip and making this post possible. As always, all opinions are my own.